This page contains step-by-step instructions for certain common scenarios that may occur whilst running a business. There are more tips, tricks and howto's in our forum. When switching from a manual billing system or software for which an import script is not available it may be desirable to have a record of past invoices issued before you started using WHMCS. Once the client and their service has been added navigate to the client's Product's/Services tab set the Next Due Date on the back to the date you want the first historical invoice to be due via their Products/Services tab and Save Changes. So for example if the client has an invoice every month starting a year ago, set it to 28/06/2011. Click the Generate Due Invoices button from the summary page and last year's invoice will be created. When prompted select "No" so a notification email is not sent to the client. Next navigate to the Invoices tab, click the invoice and then the Add Payment tab to record the payment details per Transactions. Untick the "Send Email" option so the client is not notified of the payment. Now just repeat until the Next Due Date is showing the date the client's next payment is due. Next you need to ensure you have access to the module by scrolling down the page following activation and ensuring your admin role group (usually Full Administator) has the checkbox ticked in the Access Control permissions for it. Step 1 - Choose the type of item you wish to make a pricing update to - which in this case is Domains. 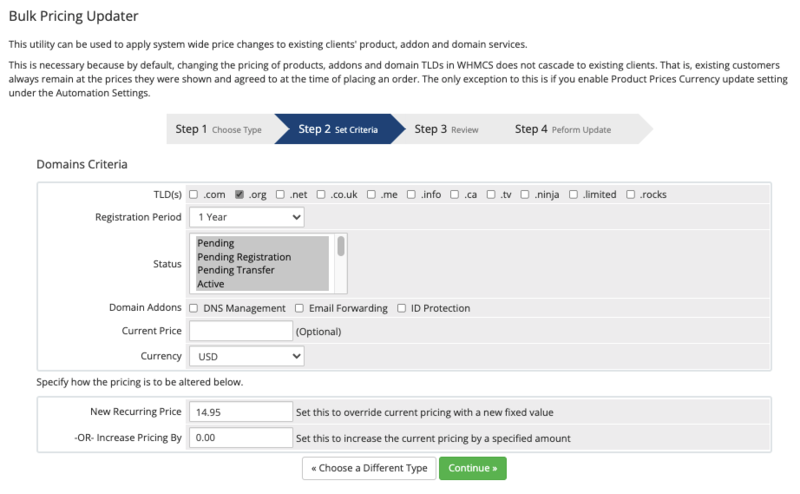 Step 2 - Specify the criteria for identifying the items you wish to change the pricing on by ticking the corresponding TLD(s) checkboxes. Next it's onto selecting the Registration Period you want to apply the change to. 1 Year, 2 Years, etc... You will need to run an update for each pricing term you offer. If you only wish to change the price of domains with specific addons active, tick the relevant Domain Addons checkboxes. This is useful for adjusting the price of the individual addons (eg. increasing the price of ID Protection one would tick the ID Protection checkbox). Finally you will also be asked to provide either a New Price to assign matching items to, or an amount to Increase Existing Prices By. You should only ever specify one or the other of these - never both. Step 3 - Review - This step provides a summary of your criteria and the change that will be made and asks you to confirm everything is correct. Once you proceed, the action cannot be undone, so be sure to check the proposed changes and criteria. Step 4 - Perform Update - The updates will be performed and the addon will tell you the number of items that were adjusted. Upon completion of an update, if you find it didn't apply to as many items as you had expected, you will be given the option to go back and refine your criteria further should you wish to edit the choices you made and try again. From time-to-time governments change the sales tax rates, this is significant as you must also update your rates accordingly. For the purposes of this example the UK sales tax - called VAT - is being increased from 17.5% to 20% on 4th January. Create a new tax rule with exactly the same country and state but enter the new tax rate. That's all there is to it, any invoices generated after this change will have the new tax rate applied, but any existing invoices will keep the old tax rate. Existing invoices will not be affected by this and will keep the 17.5% tax rates they were originally generated with. This will just mean that for any invoices generated after the change, use the new higher 20% tax rate. If switching between merchant gateways or third party gateway modules then you are now finished. If switching to a merchant gateway for the first time the client will need to login and enter their card details to the "My Details" page in the client area. The card will then be charged when the next invoice is due. If switching between tokanisation modules the client will then need to login and pay their first invoice manually which will store their card details on your processor's servers and then subsequent payments will be attempted automatically. Regrettably there isn't an way for the migration to be done without client's intervention as their CVV number is required for the first payment. If switching from a merchant or tokanisation gateway to a third party gateway, clients will need to manually pay their next invoice via the client area. If card details or a token are stored for the client you may wish to delete them via the "Credit Card Information" link on each client's summary page beforehand. Change a billing cycle from annual to monthly, with the added complication that an annual renewal invoice has already been generated. Consolidate the renewal date of several services onto the same day on a single invoice in future, even if some services have already been renewed this month. Begin by navigating to Clients > Domain Registrations and select the domain in question. Click the Modify Contact Details button. Change the registrant email address to your own and click Save Changes. Click the Transfer Module Command button. You should see a confirmation message stating the transfer was initiated successfully. It is likely that the client's Domains tab will display an error message from the new registrar, but this will disappear once the transfer process is complete. Once the transfer process has been completed, be sure to use the Modify Contact Details button to change the registrant email address back to the client's own. It is possible that not every gateway you use will accept all the currencies you offer on your site. For those that don’t, WHMCS can transparently convert the payment amount into a different currency before sending the client to the payment gateway. For example: Gateway A only operates in USD, but you have multi-currency configured in WHMCS offering prices in USD, GBP and EUR. When a client places an order for 10GBP and chooses to pay via Gateway A, the amount will be automatically converted to 15USD before the payment is processed. The client is able to make payment via Gateway A where they otherwise would not be able to do so. From the dropdown list, select your desired currency. To continue the example from above; one would choose the USD currency from the Gateway A section. And that's all there is to it! All payments will be sent to this gateway in the chosen currency, regardless of which currency the client selected on the order form. The Convert to For Processing option will appear once a second currency is configured. The conversion is based upon the currency Base Conversion Rate in your WHMCS installation at the time of payment.